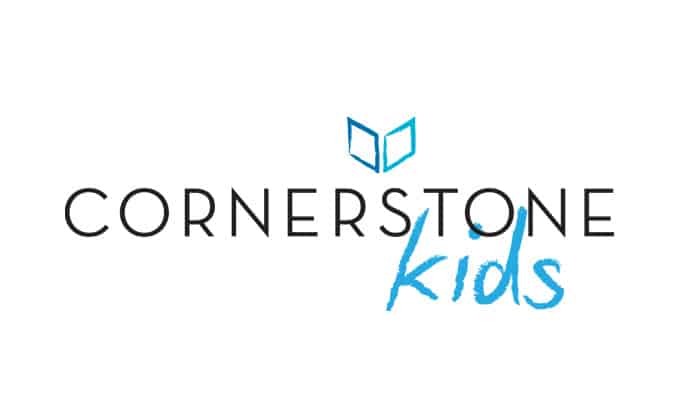 Cornerstone Church is a Christian community in Johannesburg. We love Jesus, we love people, and we’re on a mission of showing God’s love to the world. This website gives you an idea of who we are but best of all, come and visit! In light of our prayer and fasting time on 9 – 10 March, Greg Mattarelli looks at the Biblical call to pray and fast. From the morning of Saturday, 9 March until 5pm on Sunday, 10 March we’ll be fasting as a church. Everyone is encouraged to fast and pray at appropriate times during this weekend. We will also gather together as a church. Each Cornerstone site will gather at various times at its own venue. Keep your ear open on Sundays to hear what time that will be happening. Then we’ll gather as all the sites at 5pm on the Sunday, which is when we will break the fast. Please bring food to share! Fasting can be misunderstood to be a mystical or religious practice. Now while it’s true that in a time of fasting you may find yourself experiencing God in a unique way (or you may not), this does not mean the point of the fast is to have a mystical experience. We demonstrate how we rely on God to answer prayer and not any system of our own or this world’s. Fasting is a tool that we use to train ourselves to seek God first and rely on Him above all. This is not a diet – it’s a time to seek God’s face. When you fast, you devote the time you would usually use for eating to prayer. Every time you get hungry, you’re reminded about what it is you’re praying about and how you rely on God more than even bread. You can use those hunger-pains as moments of prayer to God. 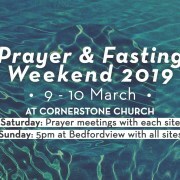 Our corporate fasting times such as this Prayer and Fasting weekend are typically used to receive direction from God as a church. Use the time to hear what God is saying to us and share any prophetic words you receive with the church and the leaders. We generally fast from all kinds of food (liquid-only fast) but you don’t have to do this if for any reason you can’t. If you can’t, you can fast anything else that seems appropriate to you – preferably something that you find you rely on every day or something important to you. Think about fasting TV or music or coffee or chocolate, for example. Yes, the last one is especially difficult! Liquidised steaks, thick soups, double thick milkshakes and the like are generally not considered ‘liquid-only’. If you have to chew, you’re probably eating! But you’re free to make up your own mind about such things and let God guide you. If you’re going to do a liquid-only fast, start eating smaller portions than you usually would a few days ahead to help get your body ready. Whenever you get hungry, use those hunger-pains as a reminder to pray. Offer up some prayer in response. Come through to a session at Bedfordview and join your prayers with the rest of us. The purpose of the weekend is not to be a hero or to lay guilt on anyone. Use discretion! If you’re feeling very ill, nibble on something light. After you break the fast, don’t go overboard! Have a light meal and keep it light for a while to get your body back into how it usually functions. Fast several times in a year so you can grow in this. John Wesley, one of history’s great evangelists, used to fast twice a week. He clearly used fasting very effectively! In Matthew 4 we see Jesus fasted for forty days and nights in the desert. Acts 14:23 says, “And when they had ordained them elders in every church, and had prayed with fasting, they commended them to the Lord, on whom they believed.” They fasted together, committing the newly appointed elders to the Lord. Acts 13:2 – “As they ministered to the Lord, and fasted, the Holy Ghost said, Separate me Barnabas and Saul for the work whereunto I have called them.” As you can see, it was out of a time of corporate prayer and fasting that God told the church to send Paul and Barnabas out to fulfil their Apostolic ministry. Want more? Here’s 105 verses on fasting. You might enjoy John Piper’s book, A Hunger for God, which you can download here for free. 15 July at Bedfordview, Craig Herbert speaks about the topic of “spiritual warfare”. 15 July 2018 at Rosebank. Nathan Gernetzky looks at the question: What is the Biblical approach to spiritual warfare? Sunday, 8 July 2018 at Bedfordview. 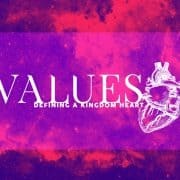 Craig Herbert speaks about the value of hearing God and obeying what He says, as part of a series on our values and prayer. 1 July at Bedfordview, Marcus Herbert speaks on prayer and why this is a value for us as a church. Sunday morning at Rosebank, 8 July. Josh Benge speaks about how we hear God and obey what He says. Sunday morning at Rosebank, 18 March 2018. Steve Everett speaks about the value of living a devoted life. When it comes to cell phones, we often have problems getting our message across to someone. Maybe they can’t hear us, the line gets cut off, their battery dies or we run out of airtime. With God this never happens. There are no missed calls, no lost messages and no, “can you hear me now”. We can be sure that when we pray, God hears every word clearly. By discussing with the children how love bears all things, we spent time this Sunday looking at prayer, and how, because of God’s love for us, He will always be available to us in prayer. We looked at Daniel in the Bible. Daniel would pray every day to God. But the king decreed that no one should pray to anyone else except to him for 30 days. If this law was broken it would result in death. Many of us would do the maths. To skip prayer to God for 30 days when I pray 365 days a year, to save my life, is easy to do. But Daniel refused to dishonour God. And so God protected Daniel when he was in the lion’s den. Daniel prayed and God listened and answered. The aim of the story was to show how despite difficulties, we should still love – how even when people are against us, we should still live motivated by God’s love. Daniel’s story is a great one to encourage your children to keep praying to God, no matter what is going on in their lives. Share some of your stories of when God heard and answered your prayers. As we come near to the end of our theme of love, encourage your children to find ways to display love to others. We will end next Sunday with our last lesson on God’s love. See your children then. 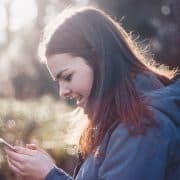 As a parent, I (Greg) am sadly aware of how often my children need to call my name repeatedly to get my attention: “Dad…dad…dad…DAD!” Too often as parents we can be so distracted or busy with something that our children need to nag us for attention or repeat their requests because we were not listening. How wonderful it is that God does not respond the way we do. God is listening to us all of the time, and He always has a response. This was the awesome truth we aimed to teach our children this weekend. God is listening to us, always. He is never too busy for us and He is never distracted that He doesn’t hear our call. He is always available to us. How comforting. Focusing on prayer this term, we taught the children how we pray to God, we get to call Him Father, and in this intimate relationship He is always there to listen to us. We taught how we need to be aware of what we say because God is always listening. We taught that when we pray, we are not just saying fancy words, or repeating a magical spell, but are rather speaking to our Father God who loves to listen to us because of His desire for relationship with us. We looked at the story in Luke 11 where Jesus teaches how even a grumbling neighbour, when persisted, will respond to a request. Our Father is far more willing to hear and respond to our requests. We explained how God’s answer can be “Yes”, “No” or “Not right now” but God desires us to persist in prayer. We can trust Him and rely on Him. Please continue to pray with your children. This week remind them that God will always listen. Even when He seems far, He is actually near and listening. With some of their prayer requests, help them to persist in prayer. Pray for a person every day, not just once. It has been so encouraging to see the children report back on how many of their prayers have been answered by our awesome God. Some of the classes did a craft which emphasised the idea of keeping on knocking by praying to God and knowing He will respond. We hope you are enjoying this term as much as we are!